A new European report suggests that some of the continent’s key animals have made a comeback over the past 50 years. Conservationists say species such as bears, wolves, lynx, eagles and vultures have increased in numbers. They believe that protection, curbs on hunting and people moving away from rural areas and into cities have helped Europe’s wildlife to recover. The analysis was carried out by the Zoological Society of London, Birdlife and the European Bird Census Council. The report was commissioned by the conservation group Rewilding Europe. Frans Schepers, the organization’s director, said: “People have this general picture of Europe that we’ve lost all our nature and our wildlife. Over the past few centuries, animals in Europe have not fared well. Hunting, habitat loss, and pollution have sent animals into decline. But this report marks a reversal in fortunes. The researchers looked at 18 mammals and 19 bird species found across Europe. They found that all, apart from the Iberian lynx, had increased in abundance from the 1960s. The largest increases were for the European bison, the Eurasian beaver, the white-headed duck, some populations of the pink-footed goose and the barnacle goose. These had all increased by more than 3,000% during the past five decades. 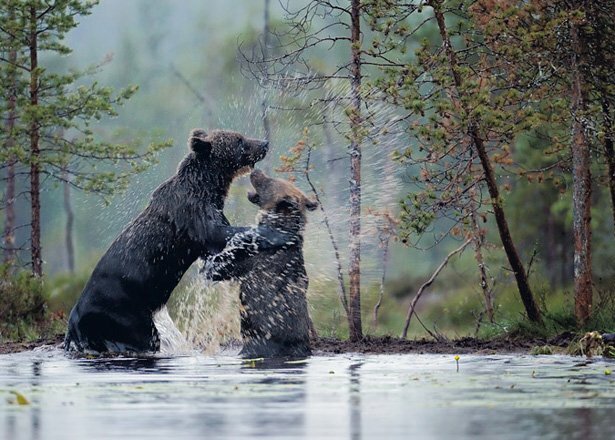 For top predators such as the brown bear, numbers have doubled. And for the grey wolf, which saw serious losses in the past, populations have climbed by 30%. For mammals, the comeback was largest in the south and west of Europe, and their range had increased on average by about 30%. The average range of the birds remained stable. The researchers believe a combination of factors have been driving this return. Legal protection in the EU, such as the birds directive and habitats directive, had helped to revive the fortunes of species, as had dedicated conservation schemes, said Frans Schepers. And while some animals are still hunted in parts of Europe, there are often limits on the number that can be killed. “It is also because people are leaving the countryside, which leaves more space for wildlife,” he said. The recovery of some species, particularly large predators, has raised concerns. In France, for example, where wolves have recently returned, farmers are concerned that their livestock is at risk. The report warns that this could be a growing problem, but suggests that governments should put in place compensation schemes to offset any losses for farmers. It also says that rural communities could benefit from more animals, as ecotourism could offer a boost to local economies. The finding is surprising when seen in the global context, where biodiversity is in continuing decline. Prof. Jonathan Baillie, director of conservation at the Zoological Society of London, said: “We’re trying to find success stories so we can learn from them, so we can see what works and scale that up across the conservation movement globally. “And it is really important that we focus on success and where we are winning. He also warned that Europe’s wildlife was at a pivotal moment. “We just have to be aware that into the future there will be increasing pressure for food production and so on within Europe,” Prof. Jonathan Baillie said. Kim Kardashian to play an alien in American Dad!